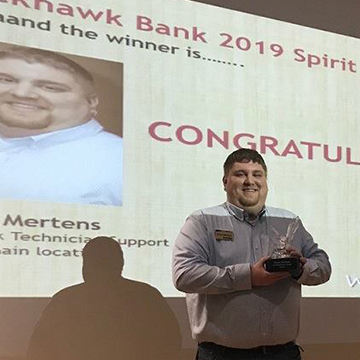 February 1, 2019 (Beloit, WI) – Blackhawk Bank is honored to announce Brian Mertens, Network Technician Support Specialist, as the 2019 Spirit Award Winner. The Blackhawk Bank Spirit Award is the highest award the Bank bestows upon an employee. To be considered, the employee must have been on staff for at least one year and demonstrate exceptional qualities in all of the following criteria areas: Be obsessed with your Clients’ success, Keep learning and teaching, Own it, Work smart play hard, Communicate in ways that engage and inform, Give back, and Be grateful. Brian was nominated by Larry Kane, AVP Facilities & Purchasing, and Jessica Hendon, VP Physical and Information Security. His nomination was further supported by his direct supervisor, Phyllis Oldenburg, SVP Technology and Operations. “Brian takes full ownership of his work. Technology isn’t always a black and white answer and sometimes things do not go as planned. Brain does not attempt to push the blame on anyone else; but, rather, embraces the challenge to figure out what went wrong and make it right. Congratulations, Brian. Thank you for all you do and for setting such a good example to those around you.